Wild caribou and domestic reindeer are considered to be a single species throughout the world. Caribou are rather large members of the deer family. domestication, have varied pelt combinations of brown, grey, black and white in the same herd. 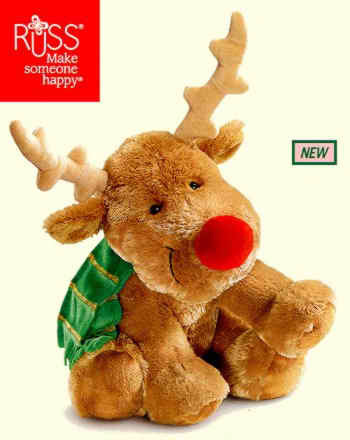 Reindeer and Caribou look different, but they probably are the same species. 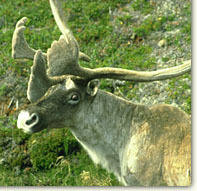 Caribou are large, wild, elk-like animals which can be found above the tree-line in arctic North America and Greenland. are very well adapted for the harsh arctic tundra where they migrate great distances each year. Caribou cows and bulls both grow distinctive antlers and bull antlers can reach 4 feet in width! A Caribou calf can run within 90 minutes of its birth. It must do this to keep up with the migrating herds. 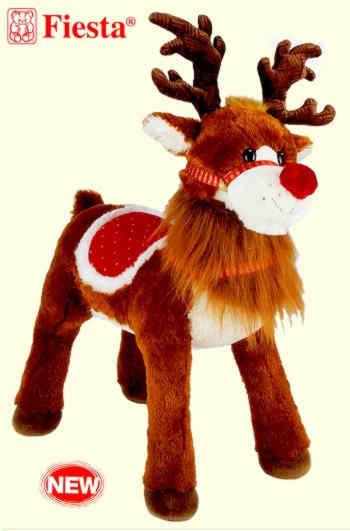 Reindeer are slightly smaller and were domesticated in northern Eurasia about 2000 years ago. Today, they are herded by many Arctic peoples in Europe and Asia including the Sami in Scandinavia and the Nenets, Chukchi and others in Russia. These peoples depend on the reindeer for almost everything in their economy including food, clothing and shelter. Some Nenets even keep reindeer for pets! Canada last century, but most attempts failed. Native peoples in these countries still prefer to hunt caribou rather than herd reindeer. In Eurasia people long ago began to tame wild caribou. Some anthropological studies suggest that this occurred in the southern Altai mountain region about 5,000 years ago. All domesticated reindeer may have derived from those stocks, for modern attempts to domesticate animals from wild caribou populations have not succeeded. and in some cultures they were saddled and ridden. Eventually people kept herds as a dependable source of food, hides and transport. Today, from the Sami (or "Lapps") in Scandinavia, all across northern Eurasia to the Bering Strait, there are Native peoples who base their economies upon the herding of reindeer. Different reindeer varieties have been developed in Asia to suit local conditions and human needs, including transportation. Chukchis have a breed that appears to be the product of longer domestication than most. Excellent for meat production, they are not so good for pulling sleds. The Chukchis may have begun keeping larger herds for commercial meat and hide production in response to the 17th century arrival of Russians. peninsula and winter can be particularly difficult; nearly half the reindeer died in the winter of 1984.
together with sinew, become the winter coverings of the large round tents called yarangas. Despite the long history of cultural contacts and movements across Beringia, reindeer Husbandry was evidently not transmitted to North America until Chukchi and Sami herders and Chukotkan reindeer were brought to Alaska in the late 19th century to teach herding to Eskimos. the continuance of herding is allowed by law.